Gloucester VA Links and News: Gloucester, VA Government, Can We Trust Them? Can we trust our local leaders? From everything we have been seeing over the past few years, it's become clear that trust is a very serious issue with local county government. From government employees who conduct personal business while on the clock as reported to us, to a county attorney who tells local residents in his own office he is not an attorney, as reported to us. From a Board of Supervisor who sits on outside public boards that make decisions that will affect the county and then votes in favor of those decisions later in public meetings, county employees who have private businesses in conflict with their county jobs, to ordinances passed and then later changed in violation of state laws? County employees seen using county garages during non business hours with the appearance that they are doing something very much in violation of their jobs? Fake search warrants issued against local residents to altered 911 recordings producing false evidence against local residents? Harassment of local residents by animal control officers? We have reported on all of these issues and more. Wild spending and blatant disregard for state laws? We see it every week in our views. 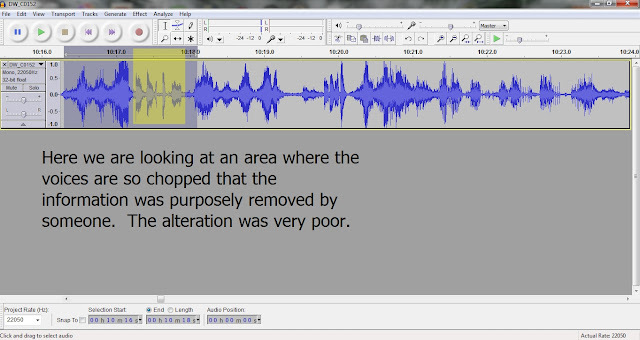 This is a screen shot of an altered voice recording used as evidence in a court case against a local citizen. From what we were able to determine, someone in the county purposely altered a voice recording? It has all the markings of such from our view. Why the voice recording was even allowed in as evidence is unknown as federal courts do not allow such evidence unless it can be clearly shown not to be altered. We have posted videos, audio, screen shots, meta data, documents and more all showing that local officials have no regard for local residents they have been sworn to protect and serve. Violations to the public trust exist everywhere from what we see. Yet Louise Theberge continues to whine about losing the race for her seat. Wondering why? Gloucester politics look to much like Federal politics. Dirty and not in the best interest of the people. https://sites.google.com/site/gloucestervanews/ Here is a host of issues that Gloucester County officials really want you to forget. Look it over closely. The information on this site makes county officials extremely uncomfortable. You have to ask why. Then you have to ask if you trust local officials afterwards. Please note: We are not saying that everyone in county government are bad. There are a number of truly great and highly dedicated employees that are worth far more than they make. The problem lies in the leadership in our view.